My kids just loves this warm and buttery steamed sweet corn. It's made with frozen sweet corn, candied bacon butter, and chives. 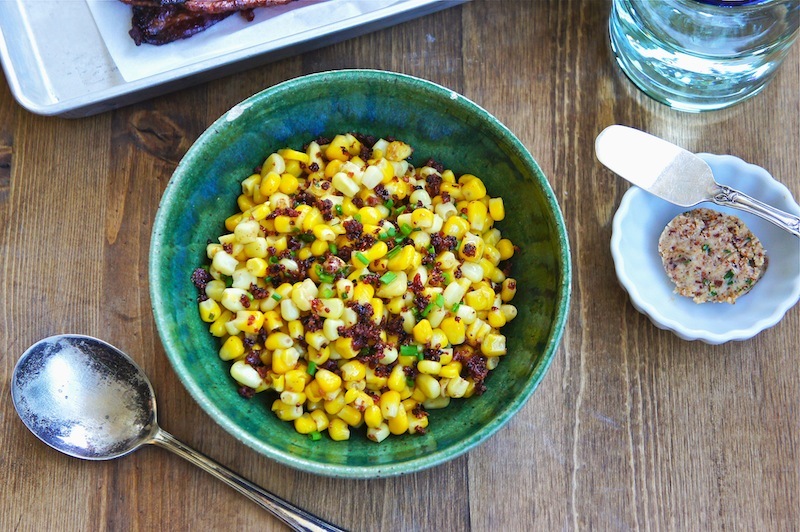 This luscious Candied Bacon Butter Sweetcorn makes a great snack or as a side dish. Make the butter: Put the butter with all the ingredients in a bowl, and mix with a rubber spatula until well combined. Transfer the butter onto the center of saran wrap or parchment paper. Roll it up, shape into neat rolls that measure about 4 to 5 inches long and tie the ends with kitchen strings. The flavored butter can be kept in your fridge for up to 1 week, or in the freezer for up to 1 month. In a large bowl, mix steamed corn with butter and season with sea salt and top with additional bacon, if desired. Serve warm. bacon and corn, two of my faves! yum! I love sweetcorn with butter and salt as it is, and i love bacon too, so i can just imagine how DELICIOUS the combination will be! !